This includes a 16'' Peter Rabbit toy with bag. This is suitable for children aged 3 and upwards. This Easter we are hosting a very special Build your own Peter Rabbit session! 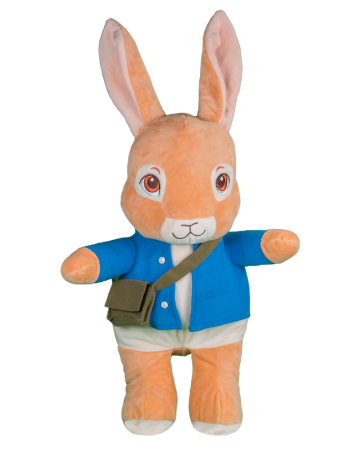 Build your very own Peter Rabbit teddy to take home! Together you will really practice your motor skills, pulling apart the fibre to hand stuff and fill up Peter Rabbit. You can add a heart inside or write a message to seal inside (or both!)  you will then be able to seal him up and take him home in a Cute draw string bag supplied in with your ticket too! You will also be able to complete your own birth certificate for your Rabbit. Please Note: No Food from the menu will be available at the event but the Tots Tea Room staff will be serving hot and cold drinks and cake at their usual charge. These are not included in the ticket cost and can be purchased separately. This event is aimed at Children aged 3+ but if you think your younger child would be able to do this with your support and supervision they are more than welcome to buy a ticket. Places for this session will be VERY limited. This session must be paid for in advance.